Pigmentation is a prevalent and distressing dermatologic concern for which many of us have seeked treatment at some stage or the other. Dark spots, melasma, sun spots, age spots, freckles, and post-inflammatory hyperpigmentation etc. are the most common issues faced by people today. These skin concerns must not be left unattended as they can have consequences which may be distressing mentally and may in fact disrupt the quality of life of an individual. Various treatments and medical procedures have come up in the field of dermatology evolving its horizons. Out of the lot, chemical peels are the most popular cosmetic procedure and are designed to give a healthy looking skin. At Veya Aesthetics, we use only products derived from natural sources for resurfacing your sensitive skin and eliminating following concerns. The peel used is decided as per the indication:- Depending on the individual skin type and texture Dr. Rajat plans a regimen which includes a single peel or sequential peeling (one peel after another) to give optimum results. Most of the peels used in Indian patients comprise superficial chemical peels treatment to minimise the chances of adverse effects. Fruit peels are effective in treating skin concerns on the face, neck, and hands. Other benefits of fruit peels include reinforced collagen production, reduction of open pores, elimination of excess surface oil and fights off visible signs of aging. 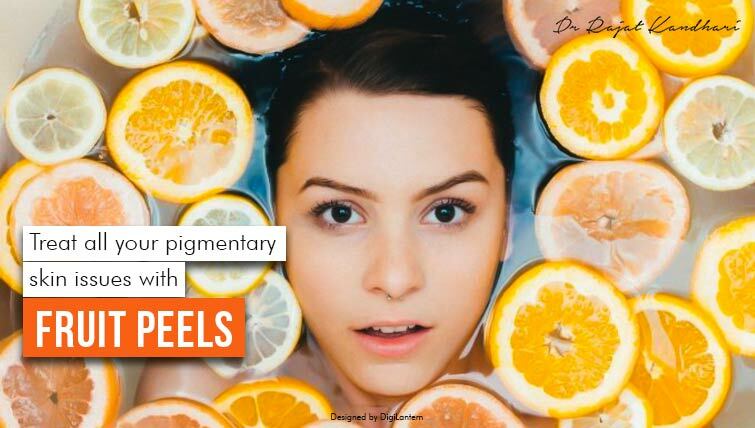 Fruit peels available are glycolic acid (derived from cane sugar), salicylic acid, (extracted from willow tree), TCA (modified from common vinegar), yellow peel (Retinol, a Vitamin A source) and various combination peels.